Washington’s Blaise Tayese keeps his eyes on the ball preparing for a return during a second singles match against Greeneview Monday, April 1, 2019 at Gardner Park. The calendar turned over to April 1 as the Washington Blue Lion tennis team hosted the squad from Greeneview High School for a non-conference match on the courts at Gardner Park on a sunny, but chill Monday afternoon. Washington won the match, three courts to two, leveling their early season record at 1-1. At first singles, Washington’s Grant Kuhlwein defeated Matt Hovan, 6-0, 6-2. At second singles, Washington’s Blaise Tayese lost to Lane Hilderbrand, 1-6, 4-6. 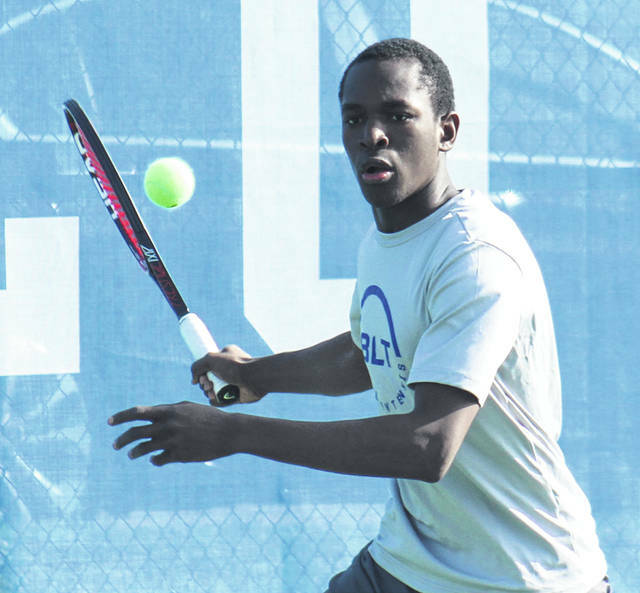 At third singles, the Blue Lions’ Ryan Elrich outlasted Grant Holloway in three sets, 5-7, 7-5, 6-3. At first doubles, Ty Rose and Garrett DeWees lost to Len Beadds and Gary Anderson, 1-6, 6-4, 5-7. Sam Schroeder and Olivia Wayne picked up a win by forfeit for Washington at second doubles. In a j-v match, Washington’s Chandler Carr lost to Ellie Bach, 0-6. Washington is home against Chillicothe for a Frontier Athletic Conference match Tuesday at 4:30 p.m.